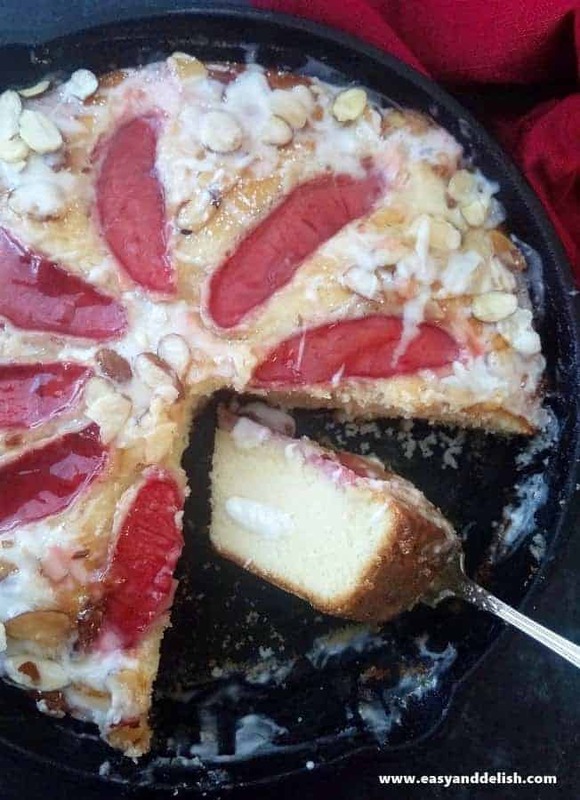 Ruby Apple Almond Skillet Cake is a delicious almond skillet cake topped with gorgeous hibiscus tea tinted apple slices. An easy-to-whip-up afternoon fall coffee cake! Easy-to-prepare coffee cakes? They are a big “yes!” at my house, especially for a cozy afternoon coffee/tea time. 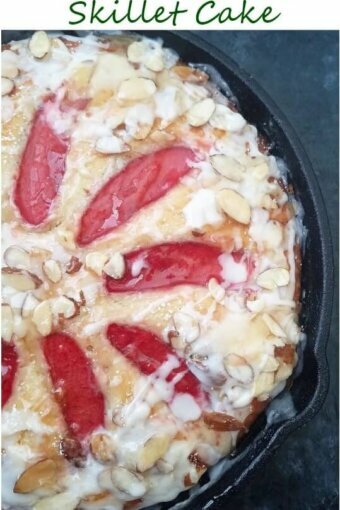 This Ruby Apple Almond Skillet Cake is the latest of them. It’s mildly sweet, simple yet beautiful, and most importantly, darn delish! Grab yourself a cup of coffee or tea, and come with me. This recipe has been loosely adapted from Bake from Scratch’s Pear-Almond Cake. 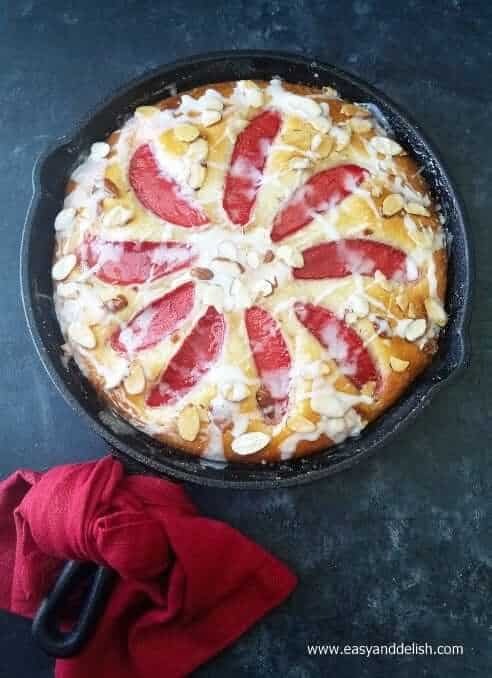 Our Ruby Apple Almond Skillet Cake adopts the same batter cake recipe as the cake mentioned above, but with a few modifications. 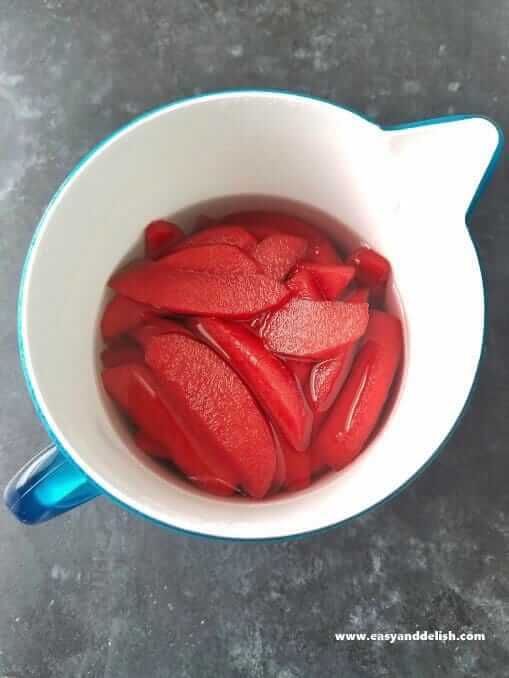 For example, in terms of the topping, we used apple slices tinted with hibiscus tea instead of pears… taking advantage of our Ruby Apple Pie fruit leftovers. 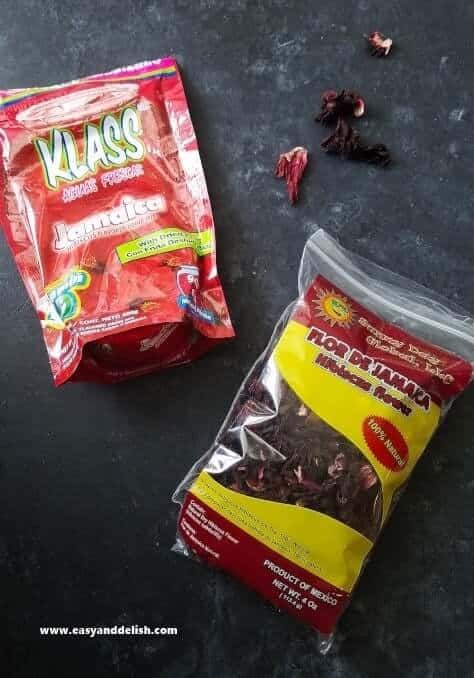 All ingredients are available in supermarkets in the U.S. and in many countries around the world, including dried hibiscus flower (or alternatively, jamaica agua fresca which is an extract of the hibiscus premixed with sugar). You may be able to find these in the tea aisle, or the Latin foods section, where the dried flowers are called “flor de jamaica” (known in Caribbean countries known as “sorrel” and in Asia and Africa by a wide variety of names). In order to achieve the luscious ruby color, I boiled several cups of sweetened water with a good amount of dried hibiscus flower. Then, I turned off the heat, threw the peeled apple slices into the pot, and let them steep in that tea until coming to room temperature. Finally, I transferred all the contents of the pot to a clean large pitcher and refrigerated overnight. We can achieve a beautiful pink or red color within 30-60 minutes. But keep in mind that the longer the apples steep, the redder the color! The rest is pretty much just a matter of making the cake batter, pouring into a greased and floured skillet, and baking for about 25-30 minutes. If you would like to sprinkle on sliced almonds, bake for 10 additional minutes. Then, let sit for about 10-15 minutes to cool a bit, and drizzle with an almond-flavored glaze. Did I hear someone say: “Yuuuuummmm!”? I hope you are ready to make a real autumn hit. This is a cake quite simple to put together in every of its 3 main steps: coloring apples, preparing batter, and making almond glaze. Start by coloring the apple slices. Whisk water with 1/2 cup sugar in a small pot over medium-high heat until sugar is dissolved (about 1-2 minutes). Then, add hibiscus flower and let mixture come to a boil. When liquid turns deep red, remove the spent hibiscus flowers using a slotted spoon or spider strainer and stir in lemon juice. Place the peeled apple slices into the pot and let cool to room temperature. Transfer everything to a pitcher or clean airtight container, cover, and refrigerate overnight. The longer the apples steep, the redder the color! Alternatively, you can use jamaica agua fresca powder to color the apples instead of the hibiscus flower. For this, whisk water with jamaica agua fresca powder (skip sugar and lemon) in a small pot over medium-high heat (about 1 minute) and let mixture come to a boil. Remove pot from heat and add apple slices, letting sit until liquid cools to room temperature. Then, transfer everything to a pitcher or clean airtight container, cover, and refrigerate overnight. Again, the longer it steeps, the redder the color! Right before preparing cake batter, pour all the contents of the pitcher into a colander and let apples drain free of the liquid for about 5-10 minutes. Meanwhile, preheat oven to 350°F. Spray a 9-inch cast-iron skillet with baking spray with flour, or alternatively grease with unsalted butter and flour the skillet. Set aside! Prepare the cake batter. In the bowl of a stand mixer fitted with the paddle attachment, beat softened unsalted butter and remaining 1-1/2 cups sugar at medium speed for 3-4 minutes or until fluffy. You may have to stop mixer to scrape down the sides of the bowl. In a separate bowl, whisk together flour and salt. Gradually add flour mixture to butter mixture alternately with 1/3 cup milk; begin and end with flour mixture, beating just until combined after each addition. Then, mix 1-1/2 teaspoons almond extract and spoon batter into reserved skillet. 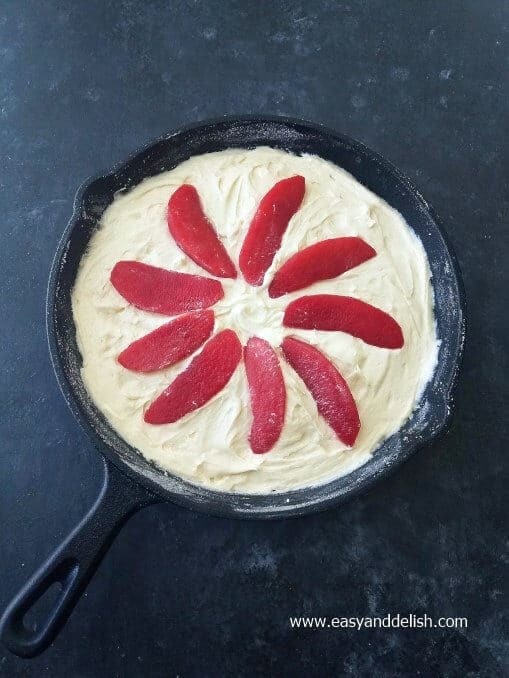 Place colored apple sliced cut side down in a pinwheel fashion over batter. Bake on middle rack for 25 to 30 minutes or until lightly browned. Sprinkle with sliced almonds, and bake on lower rack for additional 10-15 minutes or until a toothpick inserted in center comes out clean. Transfer skillet to a rack and let cake cool for about 10 minutes. WHILE cake is cooling, prepare the glaze. Whisk together 2-3 tablespoons milk, 1/2 teaspoon almond extract, and confectioners’ sugar until mixture is smooth (without lumps). Drizzle over cake and let set. Serve cake warm with a good cup of coffee or tea. Enjoy! 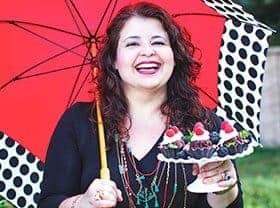 ALTERNATIVE: If you prefer, sprinkle baked cake with confectioners’ sugar after cooling down for 10-15 minutes instead of drizzling with almond glaze. Place the peeled apple slices into the pot and let cool to room temperature. Transfer everything to a pitcher or clean airtight container, cover, and refrigerate overnight (or at least for 1-2 hours). The longer the apples steep, the redder the color! Right before preparing the cake batter, pour all the contents of the pitcher into a colander and let apples drain free of the liquid for about 5-10 minutes. Prepare the cake batter. In the bowl of a stand mixer fitted with the paddle attachment, beat softened unsalted butter and remaining 1 1/2 cups sugar at medium speed for 3-4 minutes or until fluffy. You may have to stop mixer to scrape down the sides of the bowl. Add eggs, one at a time, beating well after each addition. In a separate bowl, whisk together flour and salt. Gradually add flour mixture to butter mixture alternately with 1/3 cup milk; begin and end with flour mixture, beating just until combined after each addition. Then, mix 1 1/2 teaspoons almond extract and spoon batter into reserved skillet. Sprinkle with sliced almonds, and bake on lower rack (to prevent burning the nuts) for an additional 10-15 minutes or until a toothpick inserted in center comes out clean. Transfer skillet to a rack and let cake cool for about 10 minutes. WHILE cake is cooling, prepare the glaze. 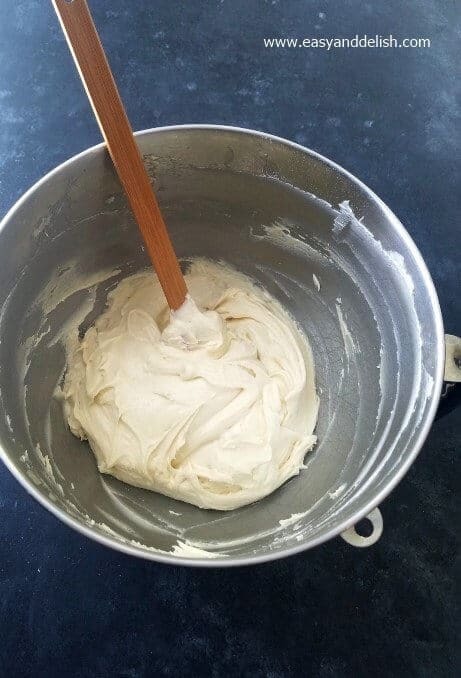 Whisk together 2-3 tablespoons milk, remaining 1/2 teaspoon almond extract, and confectioners’ sugar until mixture is smooth and pourable (without lumps). If you are wondering whether you can bake a cake in a cast iron skillet pan in the oven without problems, no worries. The answer is yes, you can. Just make sure your cast iron skillet is seasoned first. TIP: To prevent apples from looking dry, microwave 2-3 tablespoons of apple jelly for about 30 seconds and brush the apples slices that are visible through the top of the cake before drizzling cake with glaze. 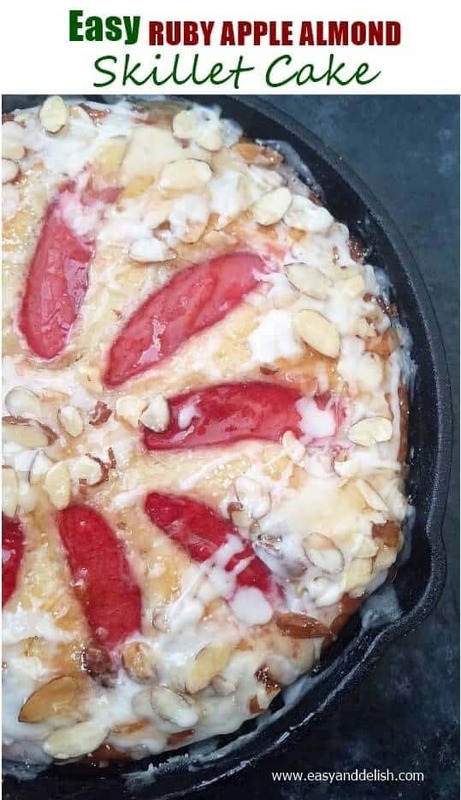 QUICK ALTERNATIVES: For making this Ruby Apple Almond Skillet Cake in a jiffy, you can use regular (uncolored) apple slices for topping the cake, if desired. You can also dust confectioner's sugar on top of the baked cake instead of drizzling almond glaze. Storage: cake leftovers should be transferred to a serving plate and kept well covered at room temperature or in the refrigerator for up to 2-3 days. Love apple treats? Try our Ruby Apple Pie. Apple season is sublime, so many excellent types to chose from. Adding the pink hue is fabulous! This is a creative recipe for me. Definitely deserves a try..